This page describes details about the implementation of our CPIQ Solution. For additional details about the initiative, see this presentation assembled by committee chair Margaret Belska. 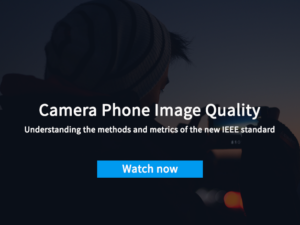 Imatest 4.4+ supports IEEE CPIQ P1858TM (Camera Phone Image Quality) 2016 measurements. As members of CPIQ, we are strongly committed to providing convenient CPIQ-compliant and equivalent image quality measurements. NOTE: You should use at least Imatest 4.4.9 for the latest corrections to visual noise calculations. For each of these sections we will discuss charts, measurement techniques, and (perceptual) Quality Level results. The last section on this page lists the JSON output locations for all CPIQ metrics. Chapter 5 of the CPIQ document describes slanted-edge SFR (MTF) measurements. It includes Acutance, which is a perceptual measurement of sharpness, derived from MTF and the human visual system’s Contrast Sensitivity Function (CSF). For measuring SFR in compliance with CPIQ, we recommend the eSFR ISO chart. 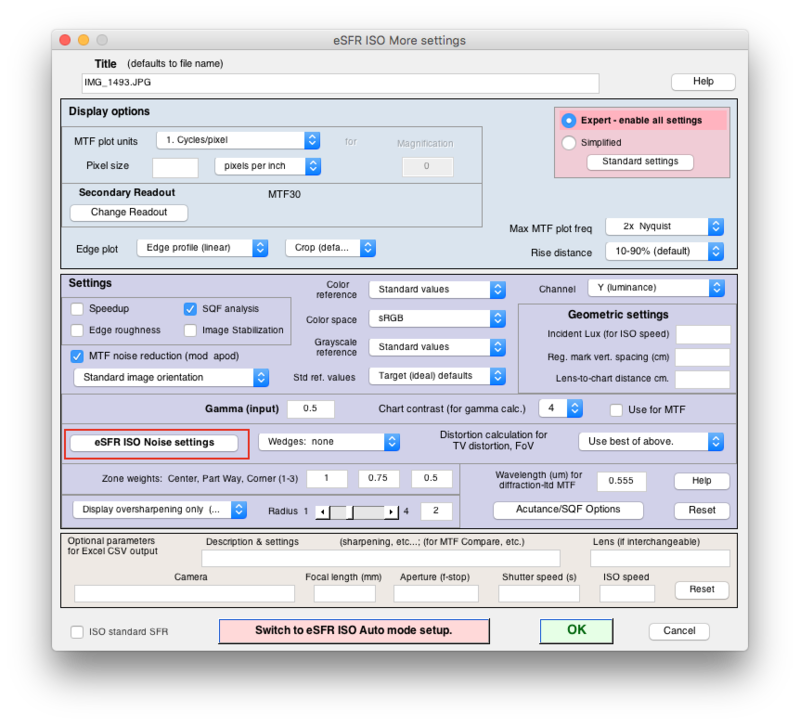 eSFR ISO has sufficient slanted-edges to map sharpness over the image surface, has a grayscale OECF chart that can be used for the Visual noise measurement, and is fully compliant with the chart requirements of the ISO 12233:2014 standard. For CPIQ, sharpness is measured as Spatial frequency response (SFR) (also called Modulation Transfer Function (MTF)). The eSFR ISO module can be used for this purpose. 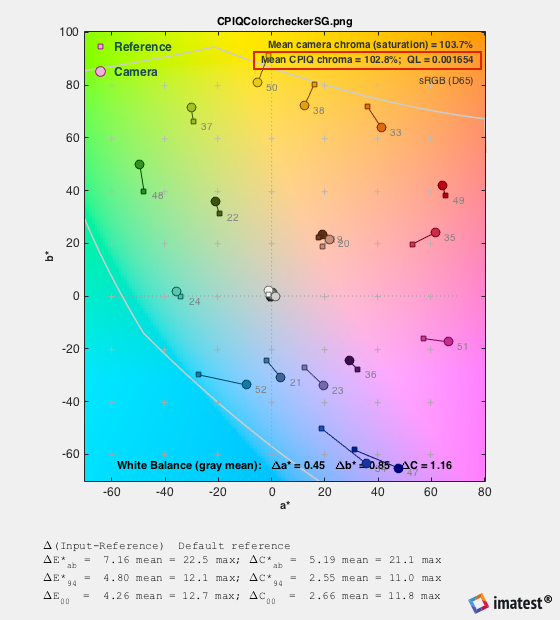 Acutance is a perceptual measurement designed to answer the question, “how sharp does the image look?” It is closely related to Subjective Quality Factor (SQF), differing only in the details of the equation. 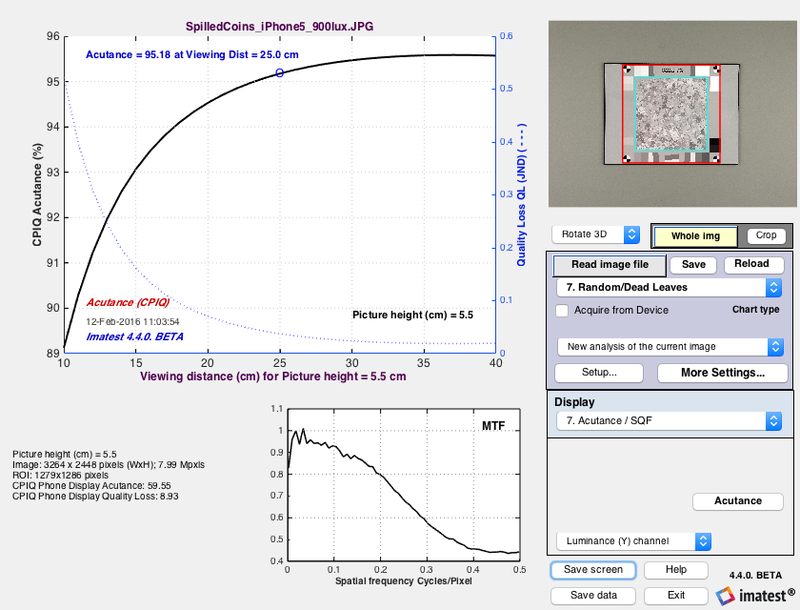 It is calculated from MTF (SFR), a model of the human visual system Contrast Sensitivity Function (CSF), and viewing conditions (image height and viewing distance). Imatest displays it in exactly the same way as SQF, which provides many of options. 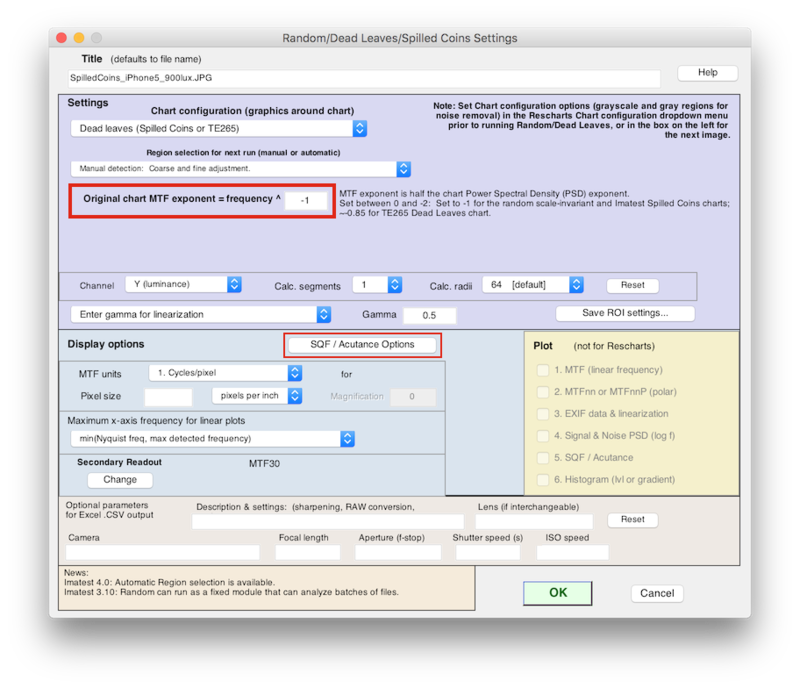 To obtain Acutance measurements, open eSFR ISO (or other Rescharts module), then click on the SQF/Acutance Options button in the Settings window (More settings in SFRplus). 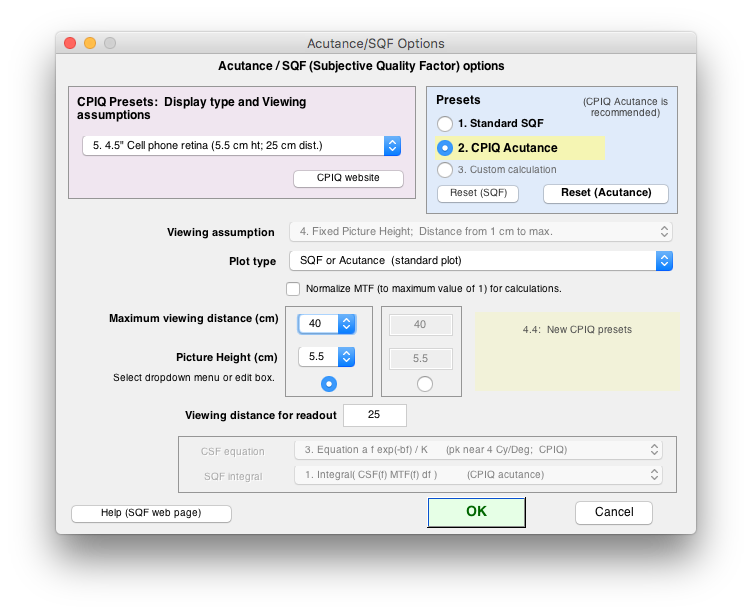 Click on the CPIQ Acutance button to select the acutance calculation. Plot type can be SQF or Acutance (standard plot) or JND (Just Noticeable Difference: CPIQ Phase 2 equation. You’ll have to make some assumption on the viewing conditions. See SQF/Acutance for details. Here are results from the eSFR ISO module display #3. We have assumed that viewing distance is proportional to the square root of the print height (which fits my (NLK’s) experience of photography galleries). It can be fixed or have a cube root function. 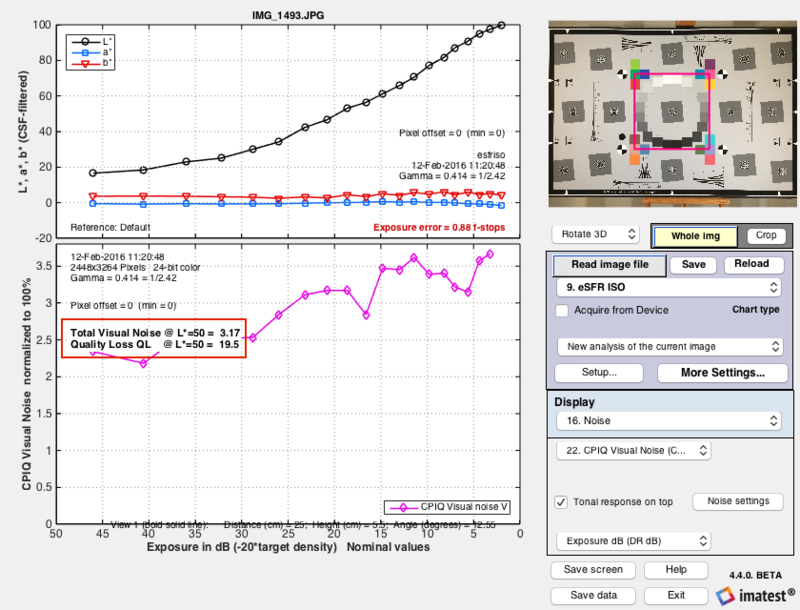 An image of the dot pattern test chart is analyzed using the dot pattern module of Imatest. 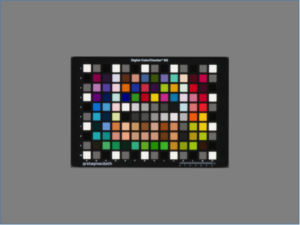 The Chroma level (Saturation) test uses the X-Rite Digital Colorchecker SG chart, shown properly framed on the right. (The chart should not fill the image. If it does, light falloff may reduce accuracy of the results.) 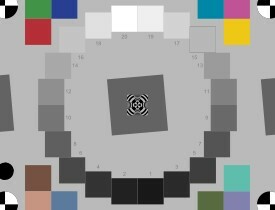 The measurement uses only the chromatic patches: it omits the black, white, and grayscale patches near the edges and center of the chart. 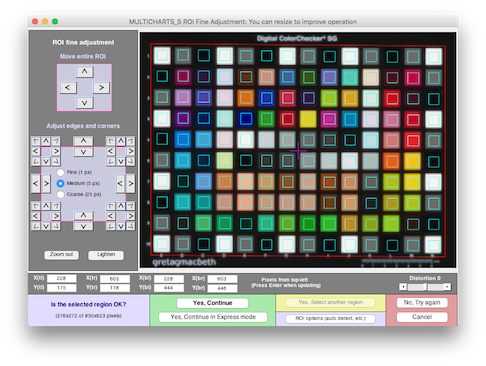 The Colorchecker SG is analyzed using the Multicharts (interactive) or Multitest (fixed) modules. The regions selection must be manually set so that the analysis regions are properly aligned with the test chart patches. The mean CPIQ chroma and quality level results are shown in the 2D a*b* plot. This figure shows a*b* values (from CIELAB color space) for patches for the 4 row x 6 column Colorchecker replica, just above the chart center (rows 2-5 from the top; columns 5-10). showing the mean CPIQ Chroma metric (measured on all chromatic patches). 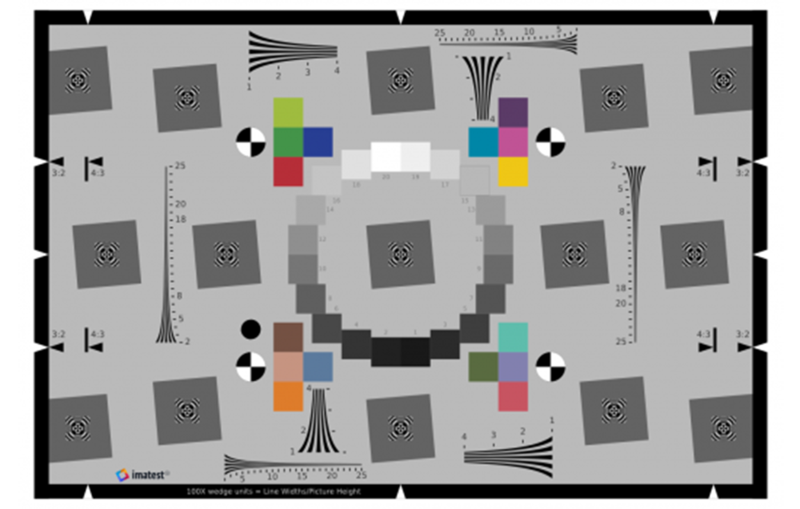 The CPIQ color variability metric, maximum ΔC = Dc, is displayed in Uniformity, Uniformity-Interactive, and Blemish Detect when Grid size is set to 20×15 for a 4:3 aspect ratio, 24×16 for a 3:2 aspect ratio, or 32×18 for a 16:9 aspect ratio and Grid calculation is set to 2. 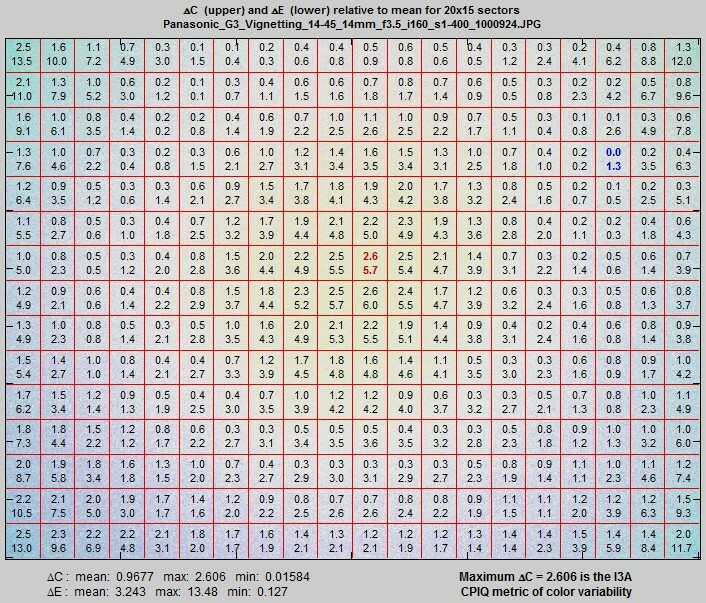 Delta-C and Delta-E. Delta-C and Delta-E are calculated for each grid region i by comparing L*a*b* values in the region with the mean for the image as a whole). It is calculated and saved in the JSON and CSV output whenever the CPIQ calculation box is checked. Here is an example of the settings. Here is the resulting grid plot. 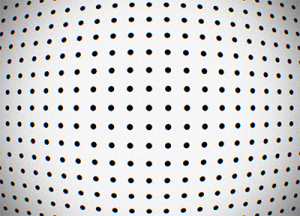 Lens distortion is measured by photographing a dot pattern chart and analyzing it with the Dot Pattern module. 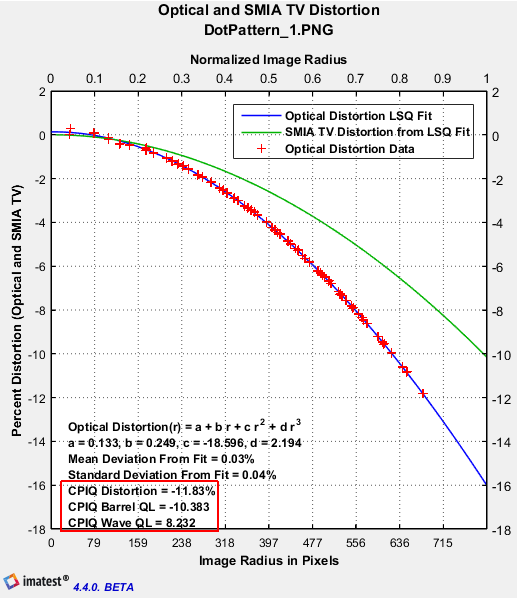 The image on the left, below shows Lateral Chromatic Aberration as a function of image radius in pixels. The image on the right,below shows optical and SMIA TV distortion. 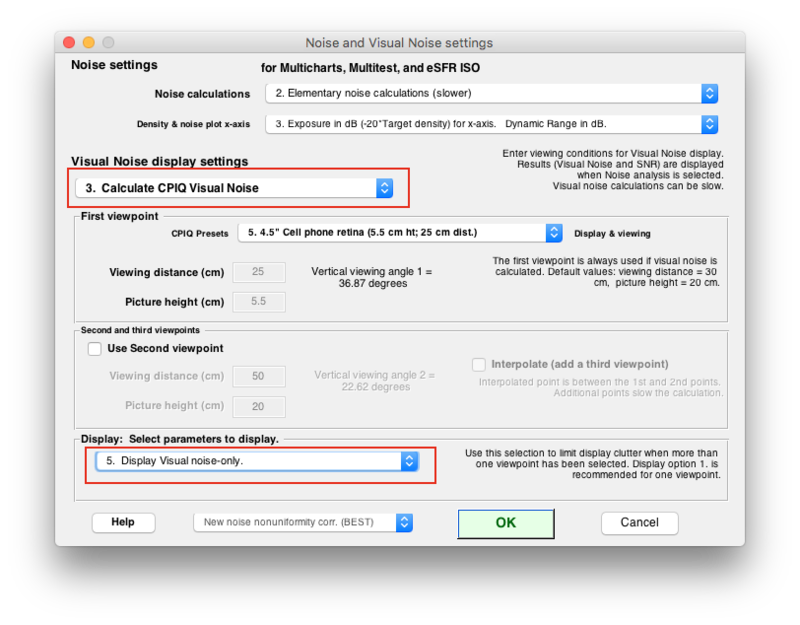 You should use at least Imatest 4.4.9 for the latest corrections to visual noise calculations. Visual noise can be calculated from a test chart that includes a ISO 14524 radial tonal patches (step wedge). We recommend using the ISO 12233:2014 test chart which includes this feature. 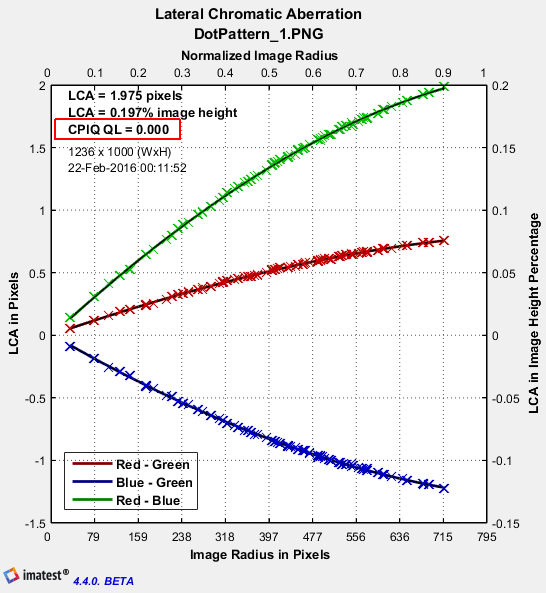 The CPIQ Phase 2 “Initial work on texture Metric” document calls for an analysis of the “Dead Leaves” pattern but provides little detail about how the results are to be displayed. It mentions Noise Power Spectrum (NPS), which is also called the Power Spectral Density (PSD). PSD is the square of the MTF. 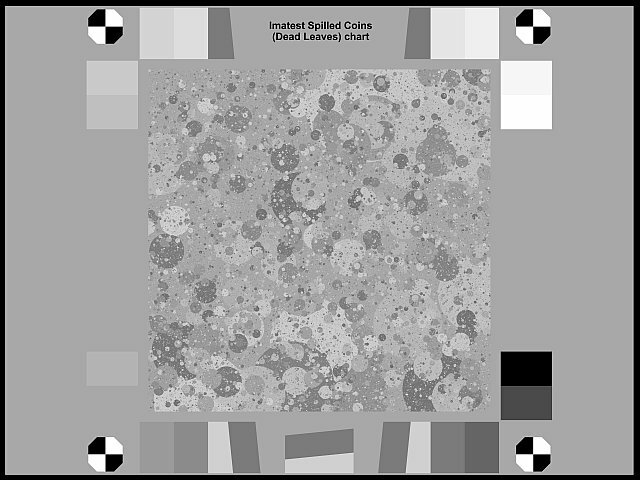 Imatest has introduced a new version of the Dead Leaves chart, called the Spilled Coins chart, that has several advantages over existing Dead Leaves charts. It is almost perfectly scale-invariant, i.e., results do not depend on magnification, and an MTF exponent of -1 (Power Spectral Density of -2) accurately characterizes the chart. It is more uniform than existing charts. The gray areas to the left and right of the chart have the same average density as the active area, making them suitable for calculating noise PSD to be subtracted from the PSD of the central “spilled coins” area. It contains slanted-edges for comparing MTF calculations. The Dead Leaves or Spilled Coins pattern is typically framed so it takes up about 1/3 of the image linearly (about 1/10 by area). This number may be vary depending on the chart design and the pixel size of the image (the pattern will require more space in low-resolution images such as VGA). More details on Random/Dead Leaves. The chart is available in several configurations from the Imatest Store. The MTF or PSD of Dead Leaves images can be measured by the Imatest Random module (a part of Rescharts). 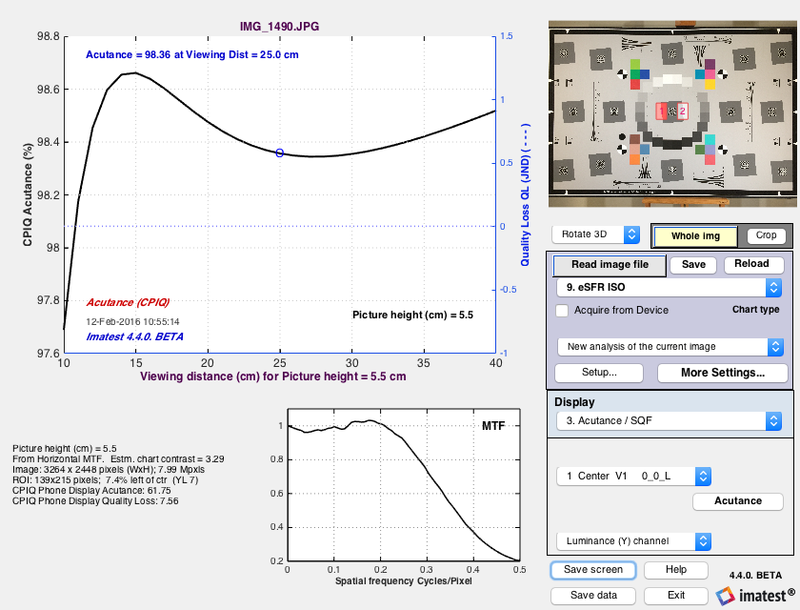 This module was designed for random (or near-random) patterns with a 1/f spatial frequency response, which is equivalent to 1/f 2 Power Spectral Density (PSD). Such patterns are scale-invariant, i.e., its spectrum is independent of magnification; it isn’t affected by changing distance from the chart. This makes extremely convenient for measurements. The PSD exponent of the Spilled Coins chart is different from the PSD (i.e., NPS) of the Dead Leaves target shown in Figure 4. It is -2 (i.e., scale-invariant, which is the ideal value) rather than -1.86 . We show a few results below. Full details are on Random/Dead Leaves.